Ravens near and far have been raised up or reviled, tarnished or exalted, demonized or deified. Throughout history people have invariably drawn contradictory and peculiar conclusions regarding the infamous avians and what they portend. 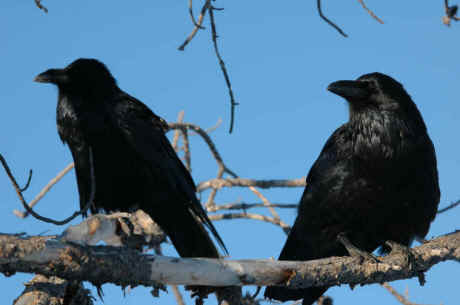 Raven is a god and man is the product of his handiwork, according to the creation myths of several Indian tribes along the Pacific Northwest coast. 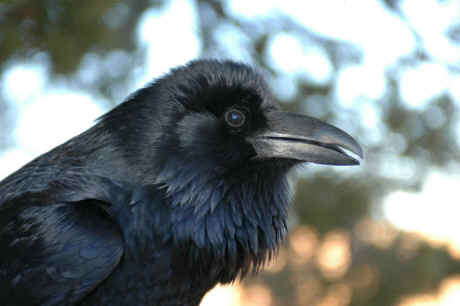 Credited as the "owner of daylight," the raven brought forth the sun, the stars and the earth and (most importantly) tempted the first humans out of a clam shell. Featured on many a totem pole, this deity has a devilish side: the sly, conniving trickster who has been known to pull pranks such as stealing the sun from the sky.